Have you seen the price of Hershey's Chocolate Syrup lately? At my two favorite grocery stores, the price was over $5 for a 24-ounce bottle! Yes, cocoa and water were also included, but I decided I shouldn't spend $5 to buy all those chemicals. Haiden and Piper like to have chocolate milk with their vitamins at breakfast, and I wanted an easy way to keep giving it to them. Plus my husband enjoys a little chocolate syrup on his ice cream, and it's an easy way to dress up a dessert. In other words, I wasn't giving up our chocolate syrup. It was just time to learn how to make homemade chocolate syrup for myself! 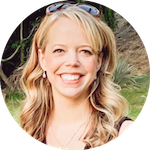 If you like this article you need to read how to make homemade Pedialyte! 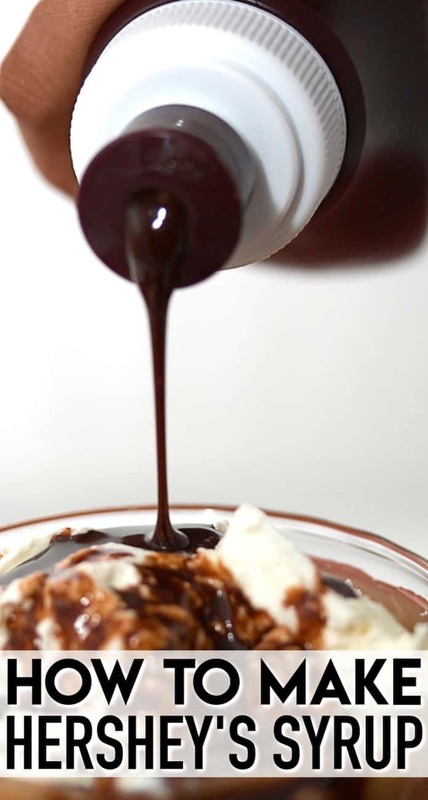 So, I wanted to share this fantastic recipe for how to make homemade Hershey's Chocolate Syrup. You're not going to believe how easy and delicious it is! Combine the cocoa powder, water, sugar and salt in a saucepan over medium heat. Mix with a whisk until smooth. Stir constantly with a whisk or a wooden spoon until it boils. Allow it to boil for 1-2 minutes. Syrup will be very thin/watery. Allow to cool completely and it will thicken to about the same consistency as Hershey's syrup. 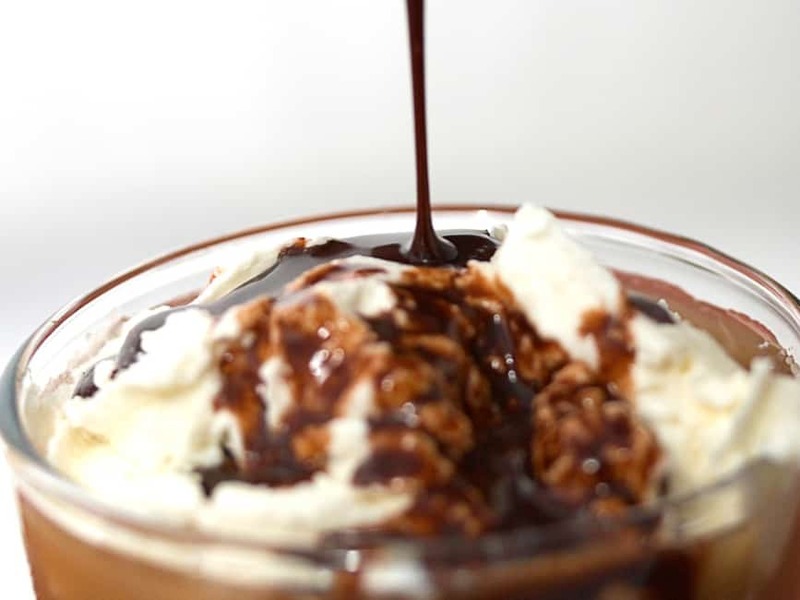 Store the homemade Hershey's chocolate syrup in a mason jar or any other container. It will keep for several weeks in the fridge. If you want to be really sneaky, pour the cooled syrup into an empty or almost-empty Hershey's syrup container and see if anyone notices the difference! 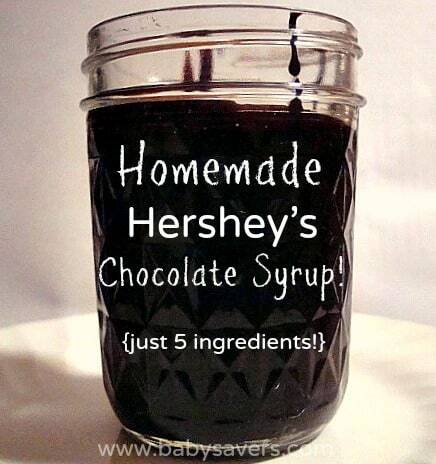 Pouring the homemade syrup into an empty Hershey's syrup container also makes it much easier to pour out. Note: I only used about 1/2 – 1 teaspoon of the homemade chocolate syrup in a cup of milk to make chocolate milk for Haiden and Piper when they were toddlers. (Their milk just had to have a hint of brown for them to consider it “chocolate milk”). Now that they're older, I add closer to a tablespoon per cup of milk to make chocolate milk. 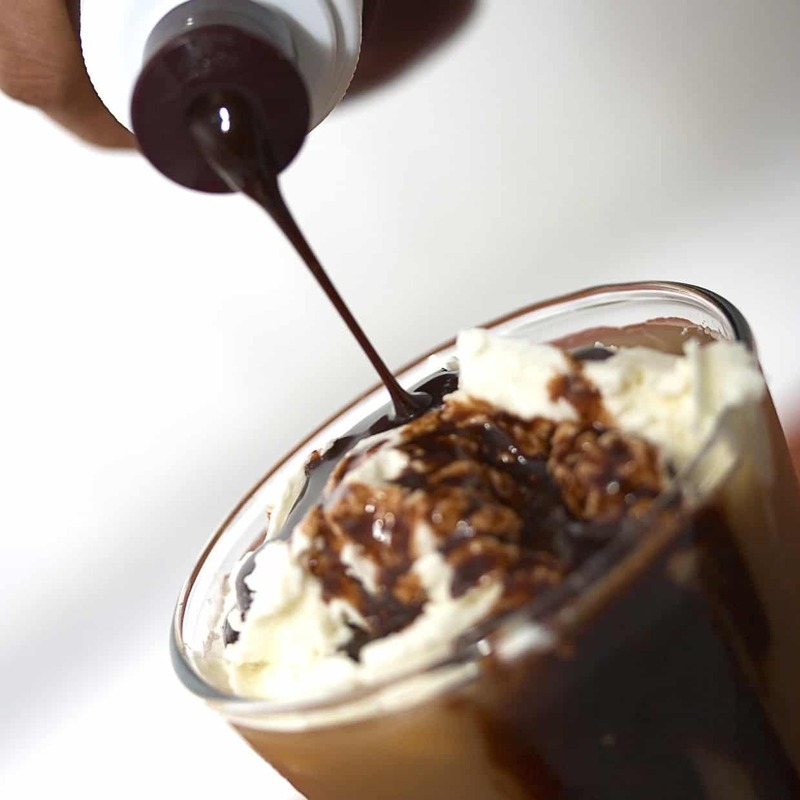 As with the brand-name chocolate syrup, you can experiment with the proportions to get the taste you're looking for. 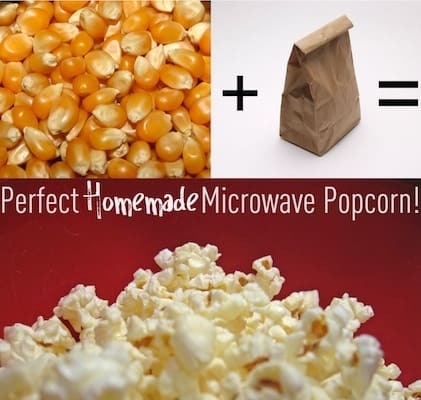 Don't miss the absolute easiest way to make homemade microwave popcorn and my delicious Vanilla fresh orange juice popsicles! I definitely need to try this. Thanks for sharing the recipe. This is amazing! 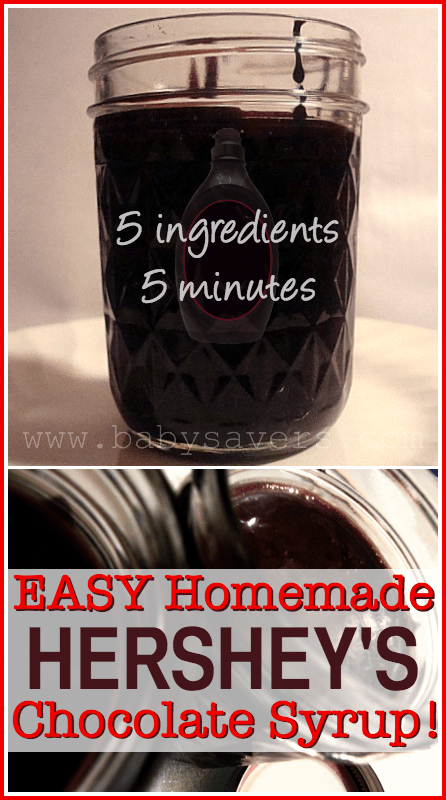 I always try to buy organic or non-hfcs chocolate syrup but had no idea that I could make it this easily! This sounds so much healthier! I used to do this all the time when I lived outside the USA. I could get local cocoa at a much cheaper price than actual Hershey Syrup! (I could find it, but the price was HIGH!) My mom told me she did it when we were kids and sneaked it into the original Hershey container without us ever knowing the difference! I have always been kind of bothered by the fact that the bottle says “Chocolate FLAVORED Syrup” so when we had trouble getting my sont o drink milk, we bought powdered ovaltine. I figure, at least it has all the added vitamins and minerals and whatnot. I use about half of what the container says to use, and he likes it. But I can totally see myself making this as an ice cream topping or the like. I LOVE that I don’t have to give my children chemicals with their milk. Thank you! 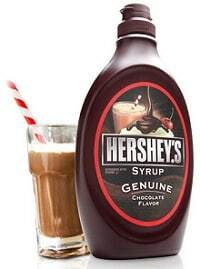 I read a report not too long ago that there is also mercury in Hershey’s syrup. I haven’t boughten any since. Thanks for posting an alternative! Ugh. MERCURY?!? That is unbelievable! I sincerely hope that isn’t true! Looks so yummy! I am going to make this tonight! What a great idea – I never thought of making it myself. I will definitely be trying this, thanks! I am always interested in name brand things I could make myself, but this has honestly never crossed my mind!! I have all of that stuff in my pantry right now. I am going to make some and see if anyone can tell the difference. Ooh! Sounds delish! Also, where’d you get that awesome glass?? Looks Ike a jelly jar. That looks yummy. My kids would like it if I made it, that’s for sure. Thanks for the recipe! I can’t wait to try this – thank you! I made this and it was so great! The kids loved it!!!!!!!!!!!!!!!! That looks fabulous. The kiddos would be all over that. We make our own cocoa. Hadn’t thought of making my own syrup. Yum. How about sharing the recipe for the frozen hot chocolate too, it looks delish! Thank you so much for posting this. 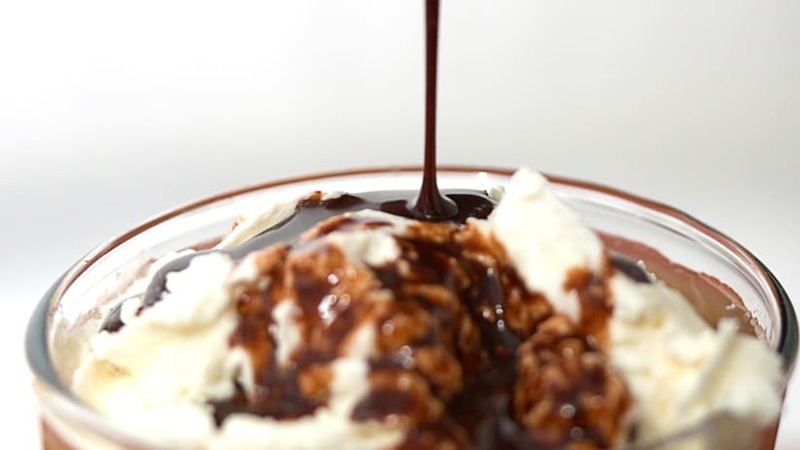 You should google homemade chocolate syrup and take a look at the recipes. They are not at all this simple, but this turned out incredible!! The 2-step link is annoying. It serve no purpose. I’m not sure what you mean by 2-step link. All the information is right on this page. Add a little instant coffee to bring out the choc flavor. Thank you!!! I´ve made it, and Loved!!! Your recipe landed in Argentina! Congrats and thank you!! Has anyone tried canning this? I’m concerned with the comment about it expanding. Don’t want to blow up my kitchen. I just made my second batch of this today. We really enjoyed the first batch even if it wasn’t quite as sweet as Hershey’s syrup. In our house we are trying to go for things that are a little less sweet anyway. Thanks for sharing. I’m hoping to get the grandkids off the scary ingredients in processed foods. Do you ever have this recipe turn grainy if the sugar sugar siezes up? I wonder how corn syrup would work. At the same time, I never eat it plain – it’s always mixed into milk in our house. I think if the sugar was at all grainy/undissolved it fully dissolves when stirred into the milk. I love this . I was wondering if you cooked it a little longer would it get even a little thicker . I’m thinking of using it as a sauce for cheesecake and would like it thicker . I love making this. I have made this twice using dark chocolate cocoa. My boyfriend prefers this over the syrup made with regular cocoa. Thank you for the recipe. I love this recipe! I have made this syrup for a few years, but make 1 substitution & 1 addition. I sub milk for the water & add 2 tsp corn starch to make it thicker. The original recipe calls for water not milk. If you substitute milk, be sure to use the syrup within a few days. Also Lena’s advice is good: mix the cocoa powder and sugar together thoroughly before adding water and the process goes much faster. The other question about sugar seizing means your sugar wasn’t perfectly dissolved. Even one sugar crystal is enough to start the chain reaction to seizing the entire pot. Always use a whisk for this recipe, don’t substitute anything else for it, and contrary to directions, don’t stop whisking until the syrup is removed from heat and the vanilla has been stirred in. This should prevent any seizing problems. I have made this several times now and I have to say that I love how simple things like this help me stretch my grocery budget. I also love knowing exactly what is in it. I have even successfully doubled the recipe with no problems. Amazing Recipe. I am making a chocolate mousse filling for a chocolate cake and I am adding this to the cream. Tastes Amazing. Definitely A Keeper. Thank you for sharing this recipe. I’ve made it twice now and I use it to flavor my homemade iced cold brew coffee and it’s delicious! You’re welcome. I’ve made this recipe so many times. It’s the best! Love the sound of this. How would I sub sweetener for sugar? Would it change the way to make it? 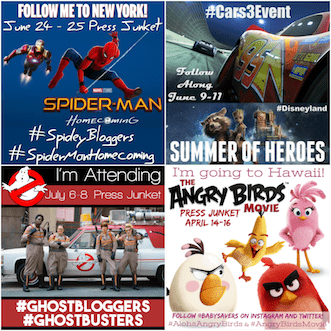 My son is diabetic and would love to surprise him Thanks.